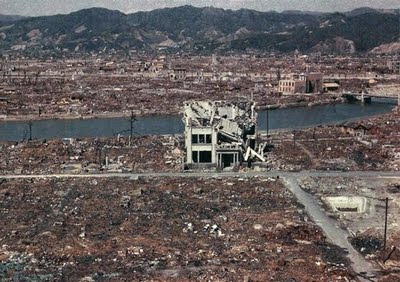 64 years since the Hiroshima nuclear bomb was dropped.. It was the first 'demon'stration of USA as a superpower and it exercised its authority as the world's big brother. It ended the war... at a certain cost. If USA proved to the world that using bombs can help them to achieve their result, perhaps this idea kinda got propagated to the terrorists we know today. So when someone detonates a bomb and ask for a certain demand, we know the historical fact of whodunit first..